Entertainment lighting, like all other segments of the consumer electronics market, is constantly changing. LEDs are getting brighter and feature rich, high performance products which are in higher demand. The only catch is that you usually have to pay a premium for the latest and greatest technology. Thanks to ADJ, the new Inno Spot Series of LED Moving Heads solves this dilemma. This new series offers a variety of brightness options and features to fit customers needs and budget. Designed for a wide variety of applications such as: Nightclubs, Stages and Churches, plus mobile and permanent entertainment applications. Now lighting designers, DJs and venues owners can feel confident to step into bright, feature packed LED Moving Heads without breaking their budgets. The four Inno Spot LED Moving Head models are: Inno Pocket Spot, Inno Spot LED, Inno Spot Pro and Inno Spot Elite. The Inno Pocket Spot, the smallest and most affordable of the four Moving Heads uses a 12W LED source. It has 7 colors plus white, 7 fixed GOBOs plus spot on a laser cut GOBO wheel, projects a 17-degree beam angle, and has a maximum power draw of only 26-watts. Special features include: Pan/Tilt Inversion mode, 4 built-in light shows, and offers control via sound activation, DMX or an optional IR remote control (sold separately). It weighs a mere 7 lbs. / 3 kg. and measures in at only: 6.25”x5.75”x10.5” / 159x147x265mm. The Inno Spot LED is powered by a 50W LED source. Special features include: a 3-facet prism, a Shutter for random strobing and pulsing effects, and is compatible with ADJ’s easy-to-use UC3 controller. The Inno Spot LED comes equipped with 8 colors plus white, 6 rotating, replaceable GOBOs plus spot (all GOBOs are metal), a 17-degree beam angle and has a max power of 93-watts. Also very compact and light weight, the Inno Spot LED weighs 15 lbs. / 6.5 kg. and measures in at: 9.75”x8.25”x11.25” / 242x206x285mm. The Inno Spot LED works well on small stages, small nightclubs and bars, roller rinks, bowling centers, and church youth centers. It’s also great for mobile DJs at weddings, corporate events and mid-size parties. The Inno Spot Pro is powered by a bright 80W LED source. This versatile Moving Head has motorized focus, manual zoom (adjustable from 12-17-degrees) and a 3-facet prism. 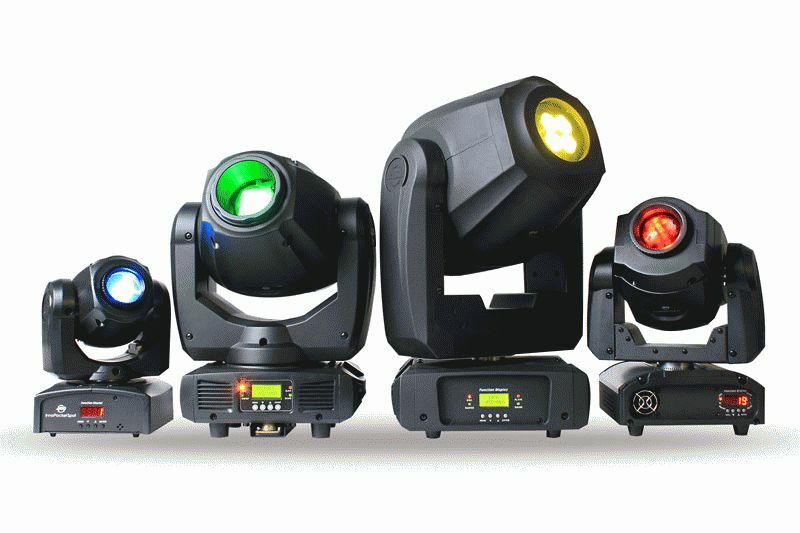 It also offers 8 colors plus spot, 6 rotating, replaceable GOBOs (2 of the GOBOs are glass), 14 DMX channels and has a maximum power consumption of 140-watts. The Inno Spot Pro weighs in at only 19 lbs./ 8.5 kg. with dimensions of 11.5”x6.75”x156.75” / 288x167x425mm. The Inno Spot Pro provides a powerful punch for larger nightclubs, churches and stages. It’s also ideal for mobile entertainers in banquet halls and school gymnasiums. The Inno Spot Elite is the flagship of the Inno Spot Series with a massive 180-Watt (8,000K) LED source. It’s high performance features include: motorized focus, motorized iris, 6-facet rotating prism, 8 colors plus white, 7 rotating, replaceable GOBOs plus spot (6 of the GOBOs are glass), 15 DMX channels, a 19-degree beam angle and consumes 197-watts of power at its max. The weight and dimensions of the Inno Spot Elite are 29 lbs./13 kg. and 13.25”x13”x20.75” / 333x328x526mm. The Inno Spot Elite is designed for large venues such as nightclubs, stages, churches, trade shows, indoor stadium and concerts. All models include 4-button digital DMX displays, 3-pin DMX In/Out, IEC IN/Out power daisy-chaining (except Inno Pocket Spot which only has an IEC input) and have multi-voltage operation (AC 100-240V, 50/60Hz).